Building Description: Very high standard apartments, all refurbished with wooden floors, new furniture, 2 separate double / twin bedrooms, lounge with fold out double sofa, bathroom and equipped kitchen. Bed layouts can be twin or double. Lounge with satellite TV and dining area. Four apartments with lift. Beautiful panoramic views. Accommodation: Very high standard apartments, all refurbished with wooden floors, new furniture, 2 separate double / twin bedrooms, lounge with fold out double sofa, bathroom and equipped kitchen. Bed layouts can be twin or double. Lounge with satellite TV and dining area. Four apartments with lift. Beautiful panoramic views. Residence manager present for any help and check in. 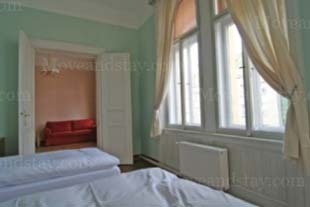 Location: Perfectly situated in the Old Town between Old Town Square and Wenceslas Square. Walking distance to all locations. If you`re looking to live in Prague for an extended period of time, we suggest you to stay at Old Town Residence Apartments for a comfortable stay. 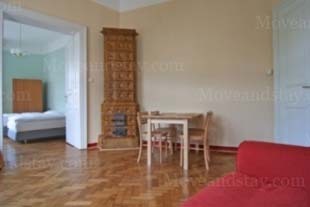 Move and Stay allows you to book easily a Prague apartment, whether you`re looking for a serviced apartment, an aparthotel, or a residential apartment for rent. Many of our Prague serviced apartments come with full accommodations, including a full kitchen and a lounge. In order to provide the most convenient service, Move and Stay helps you find old town, prague apartments for rent with our easy-to-use apartment locator. 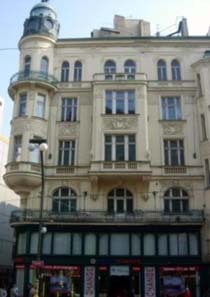 Simply fill in the required information and search for your old town, prague apartment.